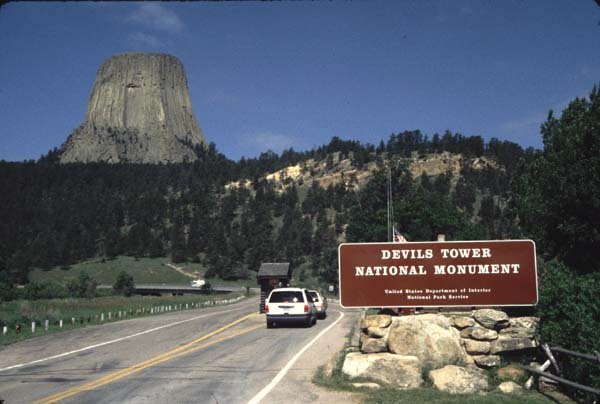 Devils Tower National Monument sits looming more than 1000 feet above the Northern Wyoming landscape, a geologic anomaly compared to the surrounding area. The summit of this ancient molten rock sits at an elevation of 5112 feet, comprised of vertical cracks amongst hexagonal columns. It is clearly an imposing presence, but perhaps less obvious is the history of controversy regarding its use. Indigenous groups have used the tower and nearby lands for centuries. However, it currently sits on National Park Service Land, causing tension between Native groups and recreationalists who both claim deep ties to the Tower. More than 20 indigenous tribes claim ties to Devils Tower and the site has been used for tribal practices for thousands of years. The Lakota people for example, often camped at Devil’s Tower in the winter to pray, fast, and perform ceremonies such as Sweat Lodge. They also used the tower for Sun Dance, funerals and Vision Quests. Today, many tribal groups still consider the land sacred and use it for many of these ceremonies. 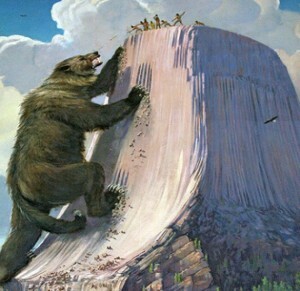 Although narratives and use differ between tribes, many tell of a bear chasing two or three American Indians until the Creator saves them by raising the rock on which they stand (the tower). The shape of the tower is attributed to the bear’s desperate claw marks as his prey move further and further out of reach. Today tribal groups are seeking to continue their religious practice as they have traditionally. They maintain that the land has ancestral significance and provides deep ties to a culture that has been severely affected by colonization and American expansion. In 1868, after conflict with westward-moving settlers, the United States Government enacted the Treaty of Fort Laramie, designating all of the Black Hills (including Devils Tower) as the Great Sioux Reservation, to be left untouched by non-natives. However, six years later, gold-seekers rushed into this protected area, in violation of the treaty, and the U.S. Government chose to ignore its previous commitment, restricting land use and banning religious practice for several years. Today Devils Tower and the surrounding land are squarely in the realm of National Park Service Land and the ban on indigenous religious practice has been lifted. Today’s controversy however, transcends mere issues of land ownership. In the last few decades, the sport of climbing has grown dramatically and climbers from all over the world have been drawn to the tower to experience its elaborate and high-quality crack systems. Many tribal groups, such as the Lakota using the land for religious purposes find that climbing is offensive to the sacred nature of the tower. Furthermore, the presence and noise that accompanies climbing can be distracting during ceremonies where intense quiet is required. Yet, this belief angered many climbers, who explained that their connection to the tower is also a spiritual one. They argued that by climbing the rock, they were engaging with in the most respectful way possible. So much concentration and physical commitment is required in climbing, that there is no room left for other thoughts. The climbers argued that through this concentration on the rock, they were treating the tower in a spiritual way, and furthermore that they were experiencing with the rock at a level far beyond that of ordinary tourism (Sacred Land). The National Park Service tried to accommodate these various beliefs by imposing a voluntary ban on climbing during the month of June (when ceremonies are numerous). This raised objections from a small portion of the climbing community, who argue that climbing is their form of religious experience. Andy Petefish, a climbing guide on Devils Tower sued the National Park Service, arguing that the ban endorsed one religion over others, thereby violating the First Amendment. A judge ruled in 1998 that the ban was indeed constitutional, as it was “in the nature of accommodation, not promotion, and consequently is a legitimate secular purpose” (Thomas 1). Yet, some climbers still feel that the ban unfairly asks them to show priority to American Indian religion over their own religious experience as climbers. As a climber myself, I am intrigued by this issue. I too place great value on the headspace achieved while climbing and consider climbing a necessary activity for maintaining my physical, mental, and spiritual health. Is the voluntary ban the most effective way to respect both American Indian religious practice and climber spirituality? Should climbers abide by the ban throughout the month of June even if it means restricting their spiritual practice? In order to reconcile these questions, I found that I needed to look at the issues both from a Western perspective of legal analysis, rights, and property ideas as well as a more holistic perspective of beliefs, ethics, and cultural understanding. Much of this conflict arises from a deeply rooted difference in property belief between American Indian tradition and United States founding principles. The United States is based on the principle that private property is equally as important as life and freedom. As one man opposed to the climbing ban explained, “the biggest right that we have is private property” (Sacred Land). Native traditions on the other hand, value land as an intimate tie to their creator, as a way to connect deeply to their religious beliefs. Emphasis is placed on being a custodian of the land rather than owning it. American philosophy gives citizens the unalienable right to manipulate land to suit their individual interests, whereas indigenous philosophy mandates that individuals must act as guardians, preserving the land in its natural state and maintaining its deep, religious connections. Those opposed to the climbing ban on Devils Tower insist that protecting American Indian religious practice unfairly endorses indigenous religions, meanwhile excluding other spiritual practices (that in case are not affiliated with major religions). Thus they argue that the ban is violating the First Amendment. Yet, even the methods for bringing justice in this case are unfairly tailored toward Euro-American beliefs. The First Amendment reflects the beliefs of the United States of America, not those of American Indians. Furthermore, the United States has failed to ensure First Amendment rights to American Indians. As explained in the film In the Light of Reverence, without support of the ban, tribal groups “are being deprived of a central principle on which the United States of America was established—that of religious freedom”. 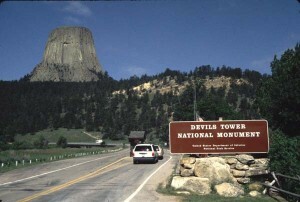 Indigenous religious practice was banned at Devils Tower until the latter part of the 20th century. Surely this was a violation of First Amendment rights. The very voluntary nature of the ban eliminates a First Amendment violation and encourages freedom of religion—which is after all, one of the tenets our country is built upon. Along these lines, the climbers against the ban are asking Native peoples to recognize and respect their spiritual practice of climbing. It is hypocritical to ask for such respect while simultaneously refusing to offer the same respect in return. Although some tribal leaders consider all climbing a desecration of the tower, they have put forth a reasonable request to refrain from climbing on the grounds that the noise it creates distracts from ceremonial practice. These leaders have asked for a compromise. And although prime climbing season includes the month of June, the tower can be climbed any month out of the year. A holistic approach to the Devils Tower conflict accounts for this concern. It also accounts for other climbing opportunities. 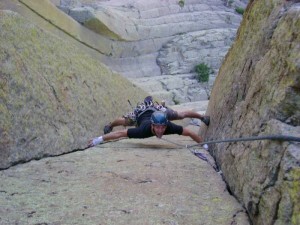 Devils Tower is an oasis of extremely high-quality rock, but it is not the only climbing opportunity in the area. There are 47 other climbing areas in the state of Wyoming, 28 of which are major developed areas (Mountain Project). Practicing American Indian groups do not have the same opportunity. Climbing opportunities continue to grow as climbers increasingly put energy into developing new areas. American Indian groups however, have already lost most of their ancestral lands, and are continuing to lose the opportunity to perform ceremonies on the few sites remaining as tourism grows. Although this assessment skims over many details of the conflict, I have found that the voluntary climbing ban at Devils Tower is an appropriate measure. It encourages respect from the climbing community, which is generally known for respecting many other issues, especially environmental ones. And it encourages respect for indigenous cultures, a concept that has been mostly absent in the last few hundred years of American history. Furthermore, the ban works. Since its inception, June climbing has decreased by 85% (NPS). The voluntary nature of the ban does allow for other ethical and philosophical issues to creep into the picture, since climbers are only strongly encouraged not to climb, and doing so is often seen as an affront to indigenous culture. In the end, even these most problematic ethical issues offer a valuable tool. They create a conversation not only about Devils Tower, but about our relationship to Native American groups and the land that we share. Hopefully this can allow an open format for further discussion. First, the US didn’t enact anything, they were given permission as a ‘trespass’ agreement ONLY to pass thru our territories. Second, Article 6 of the US Constitution states, “Treaties made with Indian Nation’s are the SUPREME LAW OF THE LAND”. So, where is the respect for this article of the Constitution? Third, my ancestor’s utilized this sacred mountain 10,000 yrs before the coming of these climbers who now lay some kind of spiritual connection to it which is idiotic and offensive. Same for those Non-Indian’s who call themselves, “Native to this land”. Third, this alter is known as Pte He Hota, not The Devil’s Tower, and although the ban/genocide has been lifted in 1978, we are still not allowed access to it. Fourth, your description of how the tower came to be is inaccurate, and whose inherent lesson directly speaks to the very nature of our Culture. Fifth, “The Land that we Share?”… This land was STOLEN, including Devil’s Tower, along with the Gold which sits at Ft Knox. To this day, the surrounding United States that are the 1851 Ft Laramie Treaty have never paid one dime to the Individual Indian’s of the Great Sioux Nation as required by Constitutional Law. So how can it be Private Property if it is Stolen? As a direct result of these historical facts, our people live in abject poverty and our culture was systematically and intentionally decimated. If there is such a thing as ethical conduct or shared spiritual understanding, then where is all this concern for the most battered and ripped off people in the United States of America who are also citizens???? I work at the Hardin Primary in Hardin Mt. I am a cultural specialist and share information with the students as well as reading stories. Where can I find the Native American Indian story about Devils Tower and which tribe? Because there are multiple tribes with vested interests, there are also multiple histories – most of them oral. The wisest approach is to obtain the information from individual Sioux nation tribal spiritual leaders. My wife and I visited The Tower and were in awe of its being. It is one of the amazing sites on our way across our great country.Our past is full of great things and I enjoy the story behind its past.Let the people that truly believe in its past have control over it.We should remember who was here first and how they lived and held sacred things we do not understand. Thank you for this clearly written article and for the replies! Would love to read more comments. I only have one thing to say. This land “DOES NOT BELONG TO THE AMERICANS!” Yes I am an American and it makes me sick to hear ANYONE other then a Native American stake claim to ANY of this land. Most of the land was acquired by simply tacking it instead of peaceful trade . These climbers who feel they should have open access to this sacred land anytime you feel at will, are way out of line. This land is to the Indians what your family home is to you. They look after and protect and respect this land as you would the home you are raising your family in. Are you willing for your family home to be open to anyone at their own will for their own needs and wants? Probably not. So why is it so hard to respect the wishes of the true rulers of this land and give them the ONE month they are asking for. I agree with Christina. American culture has become so infected with individualism and consumerism that people think they have a right to do whatever they want, with anything they want, whenever they want. The cost to the natural world and societies will come back to bite us all, probably sooner rather than later.